The Atlas map shows clearly that the edges of the Dee, and possibly the Mersey, are the places to see this scarce wintering wader and hear their strident ‘chu-chu-chu’ call. Aggregating three years’ worth of records does, however, overstate the occurrence of Greenshanks, as there were records from just two tetrads in 2004/ 05, one in 2005/ 06 and three in 2006/ 07. Three of them were recorded as estuarine habitat (H3), with others as saltmarsh (C9), water-meadow/ grazing marsh (C6) and small waterbody (G2). They feed more on fish than any other British wader, often chasing through the shallows apparently dancing with wings raised, and also take shrimps, worms and crabs, prey more likely to be found in the water than buried in mud (BTO Winter Atlas). Greenshanks breed in the high arctic taiga, mainly in marshy pools amongst forest or scrub. In Scotland, around one thousand pairs (720-1,480) breed in the open, peaty landscape of the ‘Flow Country’ (Baker et al 2006). The species winters mostly in west Africa south of the Sahara, but a tiny proportion, estimated at 3,000 birds, perhaps 1% of the population, overwinter in western Europe. These are overwhelmingly found in the milder climate along the western seaboard, with those in the British Isles predominantly in Ireland and the western and southern coasts of England and Wales (BTO Winter Atlas). 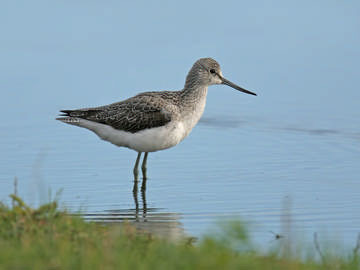 Most Greenshanks appear in Cheshire and Wirral on passage in autumn, with a few in spring. Wintering birds are rare, but have clearly become much more frequent in recent decades. Coward (1910) knew of just two winter records, in 1890 and 1904. Bell (1962) summarised its status at this season with the comment ‘its recent occurrences in winter are rare’. Greenshanks had been found in the county in 1932/ 33, 1933/ 34, 1951/ 52, 1952/ 53, 1954/ 55, 1959/ 60 and 1961/ 62; all of them were single birds, and only one of them was seen on more than one date (Lancashire & Cheshire Fauna Committee Reports, Bell (1962), Bell (1967)). According to Cheshire Bird Reports the next winter record was of two on 13 December 1970 at Sandbach (SJ75J) and subsequently birds have occurred in the county in every winter except for three of the four winters from 1978/ 79 to 1981/ 82: it may not be a coincidence that these included some of the harshest winters of recent times. The vast majority of the sightings are of birds on the Dee Marshes, probably including some in Wales, but birds have certainly been present on the Cheshire side of the Dee in at least 22 of the 34 winters from 1970/ 71 to 2003/ 04, with favoured sites being Inner Marsh Farm and the marshes off Heswall and Parkgate. The frequency of Greenshank sightings varies from year to year but there is a fairly even split between winters when birds were seen on up to three dates and those with birds apparently staying throughout the winter. Most records are of single birds but larger numbers have occurred and include up to seven seen in the Parkgate area during high tides in the early part of 1975, while Inner Marsh Farm held four on 17 November 1991 and again on 22 November 2000 and three there on 13 December 2000. The marshes of the Mersey and Frodsham have had single birds on single dates in five winters during this period with sightings in each month. The area of the north Wirral coast from Leasowe to Meols held a bird in seven of the ten winters from 1994/ 95 to 2003/ 04, often for lengthy periods, and probably accounted for sightings in two winters at Red Rocks and Hoylake; three were at Meols on 2 January 2001. Hilbre has recorded a bird on three winter dates before this Atlas. Greenshanks inland in winter are unusual (BTO Winter Atlas) and the only county records in recent years are the two at Sandbach in 1970 and singles on single dates at Woolston (SJ68P) in 1985/ 86, Kingsley (SJ57T) in 1992/ 93 and Bar Mere (SJ54I/ J) on 10 December 2003. The increase in wintering Greenshanks is presumably a result of the ameliorating climate.